Use this method to attach a horizon to a different 3D survey. It is required when a user selects the wrong survey when importing a horizon. The IL/CL/TWT values remain the same, but the horizon is repositioned by using the spatial locations from the new survey. The horizon will change its location in X/Y. Note: To keep the same spatial location, but use different IL/CL values (from another survey), use the Regrid operation in the Map View. In the Control Panel, go to the Horizon tab. 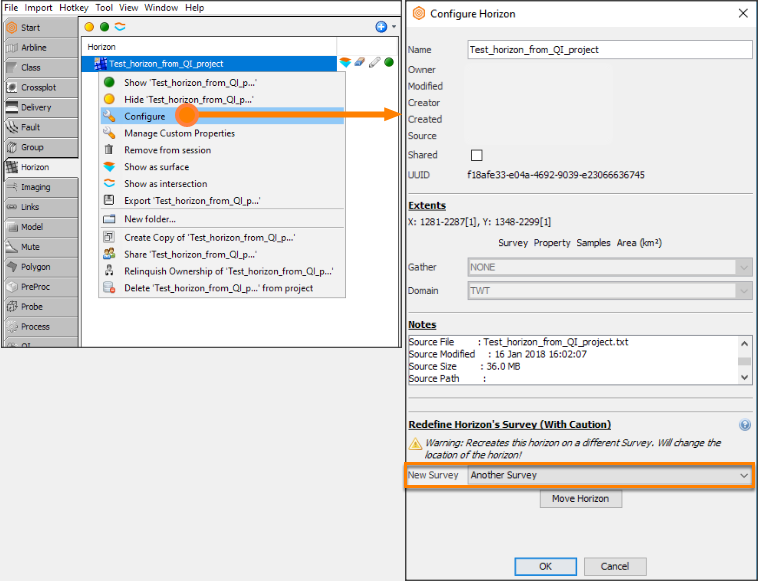 Right-click on the horizon and select Configure. In the New Survey field, select the correct 3D survey.